It is finally here. 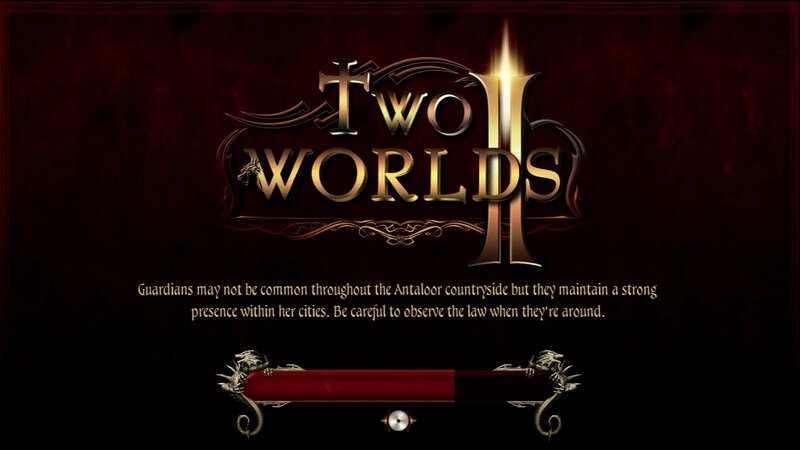 10 months after getting a glimpse at PAX East, I finally have my hands on Two Worlds II. I’m not sure why, but I’d anticipated this game more than any other over the course of the past year. Maybe it is because it seemed to be such a vast improvement over the original. Maybe because it seemed to have so much potential. All I know is that I managed to hype it up in my own mind and on this site to an almost unreasonable degree. Now the time has come to see if Topware managed to produce an Action RPG deserving of such praise. 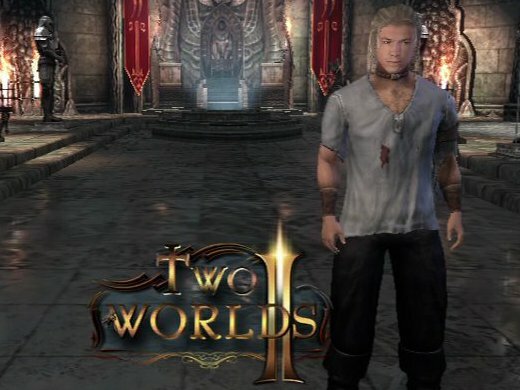 Right off the bat, Two Worlds II is a gorgeous game, particularly with regard to the massive and detailed environments. For the most part, interiors are filled to the brim. Castles and keeps are decorated with bookcases and pedestals, chandeliers and globes. The indoor portions of the map seem to have their own separate lighting system, providing point lights in the form of torches, lamps, and balls of magic to cast flickering shadows across the walls. It isn’t all stationary either. 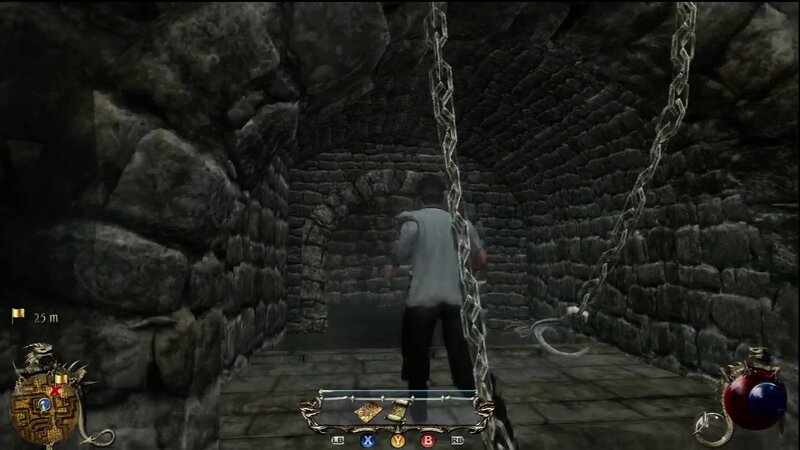 Dangling chains collide with your character and barrels and crates can be carried or pushed. Outside, a depth of field effect makes already sprawling fields seem even larger. The sun baked Savannah does an excellent job of seeming almost painfully bright, and the sun glints realistically off of weapons and armor. Water along the shore rolls with waves and shows a hazy reflection of the environment. Wildlife shows up not only as the window dressing of tropical fish beneath the surface and vultures perched on the cliffs, but as a veritable menagerie of creatures who want to tear you to pieces. This is the first game I’ve played in a while that saw me locked in a battle royale between myself, a pair of baboons, an ostrich, a giant ant, and a rhino. 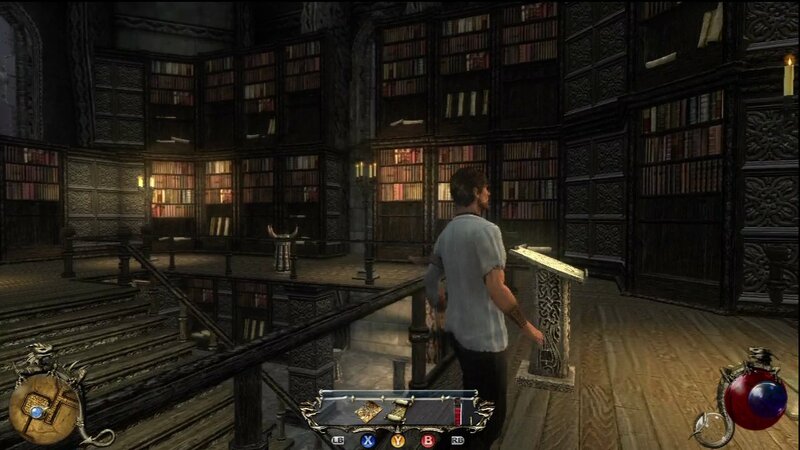 The player character and NPCs, while not quite as impressive as the setting, are still well made. 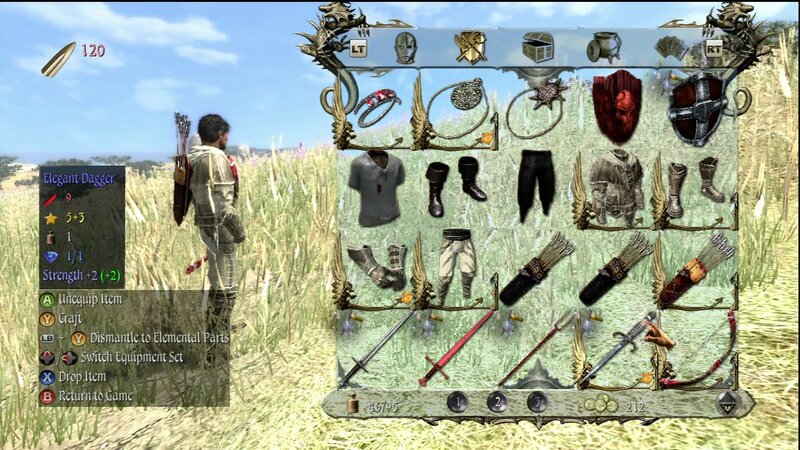 Hair and clothing details drift flutter as you move, and the fact that you can die your weapons and armor means that you have a huge amount of control in your appearance even after you’ve crafted your character with the character creator. 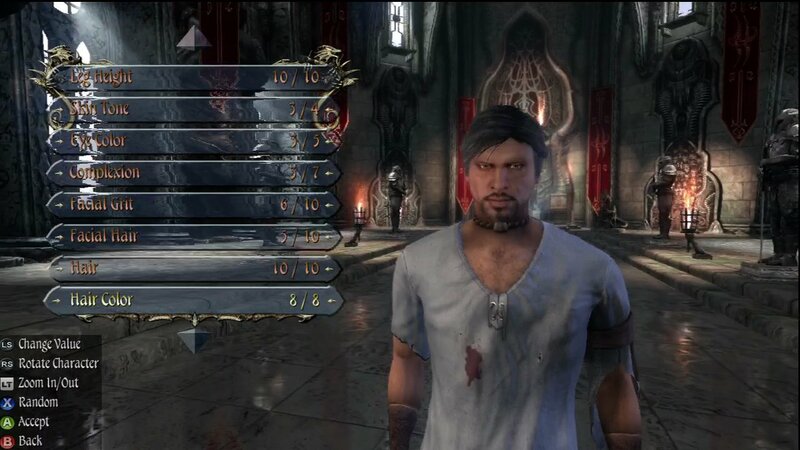 Said creator, which is the first thing you interact with upon starting a new game, lets you adjust most of the aspects of your character’s appearance. While there is a long list of tweakable features, the changes you make are very subtle, some so minor that I can’t tell the difference regardless of setting. The small changes prevent you from creating something too comical or absurd, while still allowing you to get a good range of appearances. If you really work at it, though, you can lodge something firmly into the uncanny valley. Most of my complaints with the appearance of the game stem from the animation and the UI. There is a novel system for dealing with dialog in the game. Rather than forcing you to stay put and just banter back and forth, TWII lets you pace around while discussing things. Ideally, this would allow you to stage your own dramatic turns and such. In my case it was an excuse to spin in circles like an idiot and completely miss what was being said. During these chats, the animators did their best to provide lip-synch and gestures that match the mood. They didn’t quite hit their mark. The lip-synch is so-so, but there are few games that get that right. As for the gestures? There only seem to be about half a dozen different ones, and they almost never seem to have much to do with what is being said. It gives the dialog sections the feel of a Speed Racer cartoon, with people shrugging and waving their arms about seemingly for the sake of moving. The UI, for reasons I cannot fathom, started off clipping off of the screen on all sides. The legend that lists the available buttons and their actions was far enough off screen that I couldn’t actually SEE the buttons associated with the actions. Poking around in the menu turned up a “Use Safe Section for Interface” option that pulled things back where they ought to be. Unless my TV screen is abnormally small, and this is the first game I’ve had an issue like this with, I think that maybe this option should have been on by default. At the very least it should have had a more obvious name. Once the HUD is entirely visible, it makes the screen feel a little cluttered, which is probably why they’d moved it so far out to begin with. There were scattered other rough edges, with frequent small loads when moving through the large areas, usually little more than stutters, and scenes that start just before they are done loading, leading to set pieces and characters suddenly popping into existence during an otherwise dramatic moment. 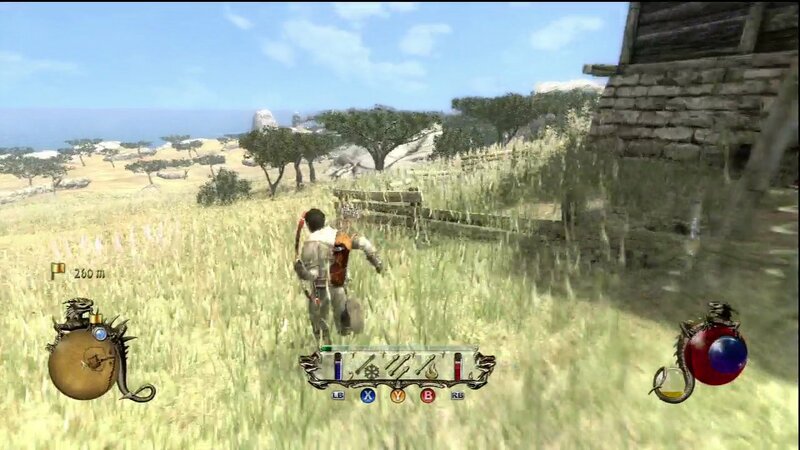 Aside from those foibles, I really like the look and feel of the graphics. Twinkles and icons show you where interactive objects are, and the various meters you need to track are prominently displayed and easy to read. I’ve got to start this section with a disclaimer. There is a LOT to do in this game, and I could write about the gameplay for twenty pages and not describe everything. What you’ll be reading here is just what managed to stand out to me in the first few hours of play. This being an Action RPG, we’ll start with the combat. 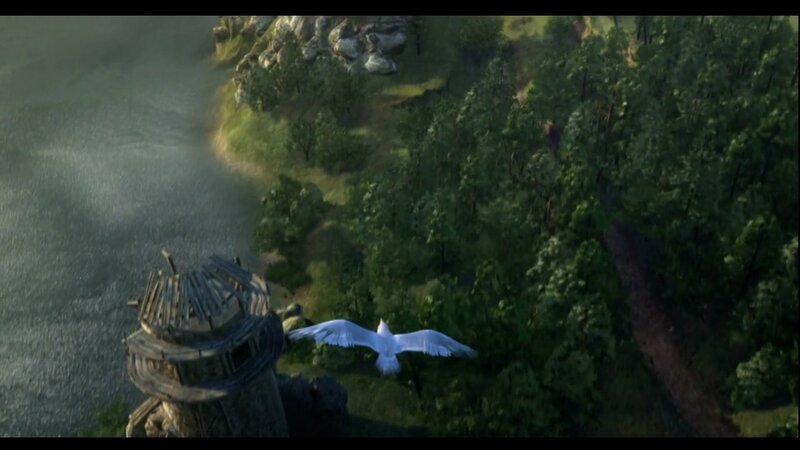 There are three distinct paths that you can work toward: Archery, Melee, and Magic. Melee is the typical hack and slash. Pick a target, block until they attack, attack until they block. It is deeper than that of course, with attacks that shatter defenses, combos, counters, and more. You have a number of classes of weapons that seem to boil down to one-handed or two-handed, slicing, bashing, or piercing. 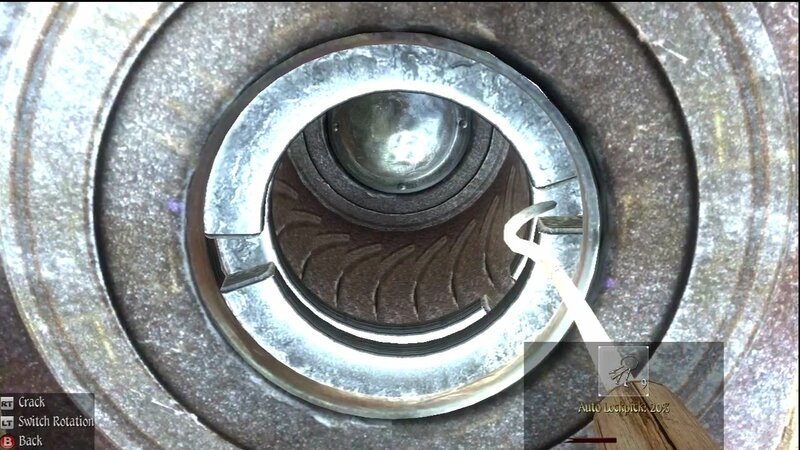 Shields can enter into the mix as well, provided that you have a spare hand. 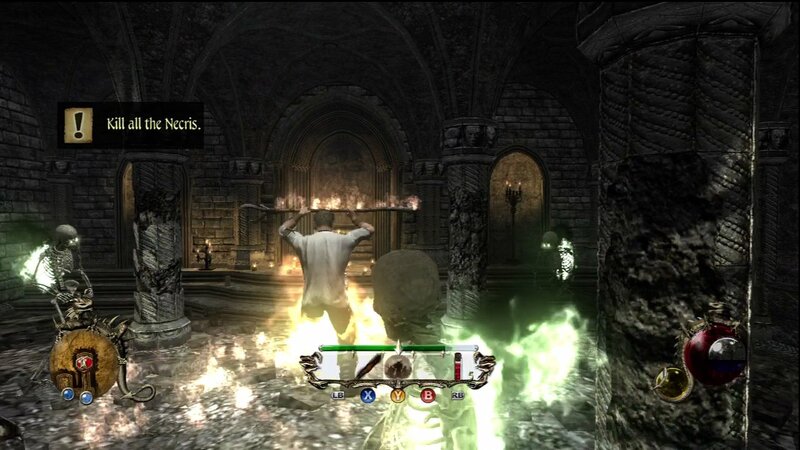 The Melee combat works pretty well, but I personally didn’t spend much time with it. Mostly it filled the role of “when all else fails”, while the other two paths attracted my attention with their innovation. Archery, for instance, simplifies things from more realistic games like the Elder Scrolls series. Rather than worrying about keeping a stock of arrows, you instead have an unlimited supply, with the specific attributes of the arrows being drawn from the quiver that holds them, as well as the bow, of course. Holding the draw button slowly fills a meter that indicates how much damage the shot will deliver. A hasty, off-the-hip shot will barely scratch your foe, while a full draw will take a nice little bite out of their health and likely stagger them as well, interrupting any attack they might have been readying. Most of the time the game will paint an auto-targeted cross hair on the nearest foe, but you can move it to other threats if you choose. Some attacks will add an area effect to your arrow and will remove auto-targeting. You also get a “sniper” mode. 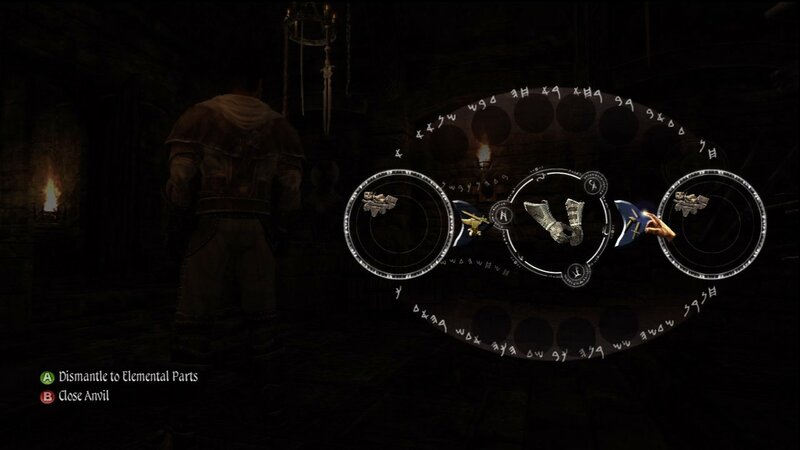 This likewise lets you manually aim, and depending on where you spend your skill points, will do extra damage or let you mark individual targets for your multi-arrow skill, launching a volley of arrows simultaneously. In combat, you are able to slowly strafe while an arrow is drawn, letting you avoid other ranged attacks and keep slower enemies at bay while you line up or charge your shot. Magic has a few things in common with archery, but adds a spectacular level of customization. Spells are constructed out of spell cards. The number that can be applied to a given spell is dependent on your level of mastery, which is developed via skill points. 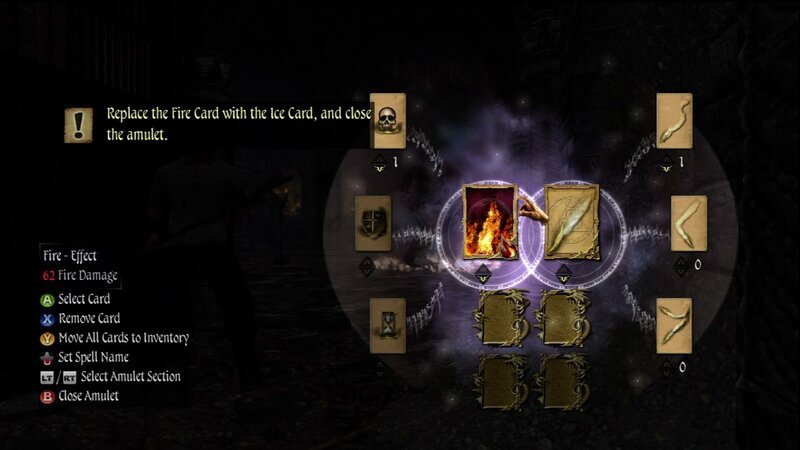 You start with missile and area effect spell types available to you, and you can treat them more or less like weapons with interchangeable ammo, changing an ice spell to a fire one by swapping out the appropriate card. Later you’ll get a wider variety of cards and will gain the ability to craft an effectively unlimited variety of spells using various payloads and delivery methods. Remove damage to make a stun attack, add homing to track enemies, add duration, you name it. I don’t know if anyone besides me ever played the Genesis “Home Alone” game, but crafting spells reminded me a lot of the weapon crafting from that game. Once constructed, spells require mana to cast. The mana slowly (or quickly, if you’ve devoted enough points) recharges, and you can speed things up further by drinking a mana potion. Rounding off the combat is a method that is more of a skill than an actual battle type, Assassination. 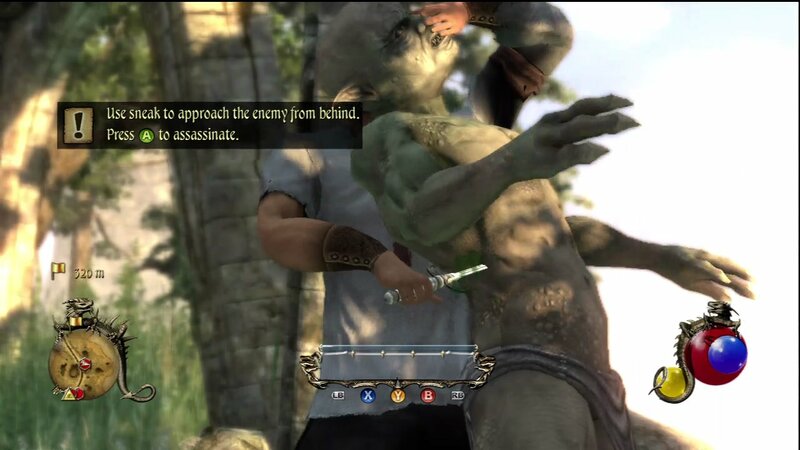 From time to time a guard will be standing with his back to you, and you can enter sneak mode and draw a dagger. If you get close enough without being noticed, you’ll get a deathblow indicator that will instantly and silently put him out of your misery. AI isn’t the best. Enemies have set areas that they defend, and rather than lingering at the rim of their active area when you leave it, they will turn around and run all the way back to their origin point when you get far enough away. That means that, as an archer, you can perforate their backs with arrows while they run back to their spawn point and they won’t turn around until they get there. Likewise, once the environment gets complicated, pathfinding can get a little screwy. 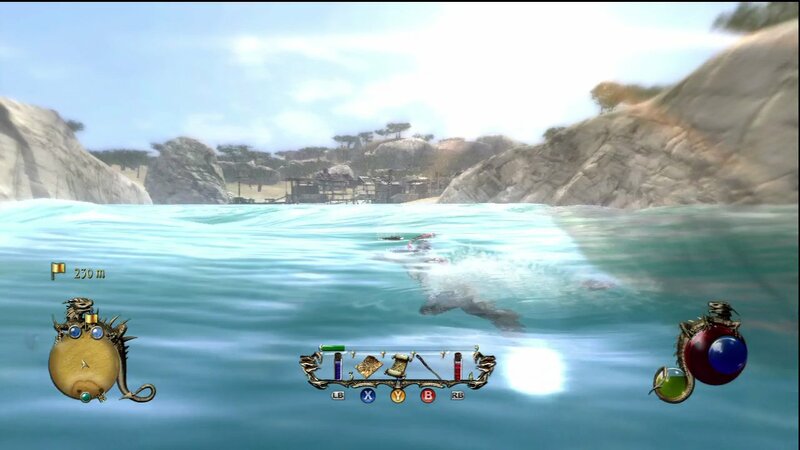 I was able to defeat an early boss who probably should have been very difficult by luring her off the edge of a seaside cliff, then raining arrows onto her while she swam pointlessly at a section of shore with no place to climb up. Most of the time, though, the design of the combat areas prevents such things from being an issue, and if you focus on melee you probably won’t encounter them at all. If you start to take too much damage, aside from the usual health potions, you can also sheath your weapon to begin regenerating health, allowing you to spend a little time to save a few potions. This isn’t terribly necessary, though, because your character is a renaissance man who can do a little bit of everything, including alchemy. Ingredients are purchased or found, and each has a base attribute. Combining several with a health restore attribute will produce a health potion. Other effects produce other potions. You could also mix things all willy nilly and see what happens, but you might not always get something helpful. Recipes are automatically saved as scrolls to avoid making you rebuild them by hand. Skill points can be applied to allow you to craft more complex, effective an potent potions, naturally. 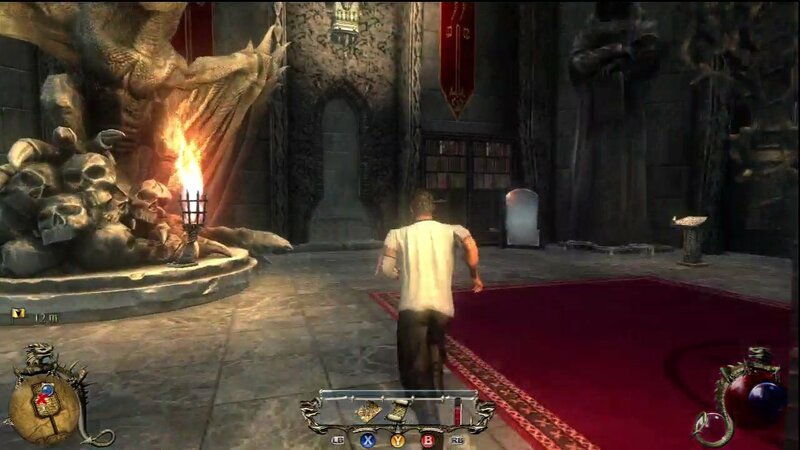 As is typically the case with a game of this sort, whether you are playing as a heroic or underhanded character, you will be looting corpses and robbing houses. That means you’ll accumulate junk, but the game has found a way to make even THIS into something worthwhile. Any weapon or armor you don’t want can be torn down into its basic parts. These parts can then, based upon your crafting and metallurgy levels, be used to upgrade the weapons and armor you DO want. This will allow you to stick with a preferred weapon, adding not only to its attributes but customizing the color and adding sockets for gems which further boost its numbers. Said gems are subject to their own crafting branch, allowing you to merge small ones into large ones to pack the punch of multiple gems into as single socket. 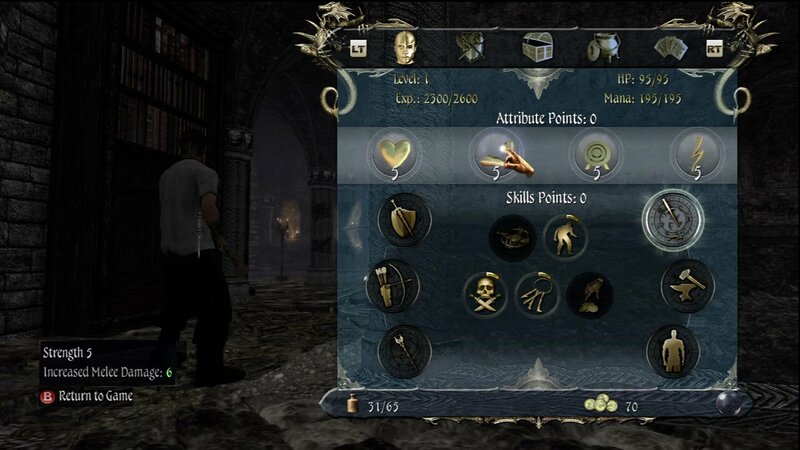 Leveling up, mostly done through combat, provides you with separate skill points and attribute points. Attributes are dumped into Endurance (Strength/health), Willpower (magic), Accuracy (Ranged attack) and Agility (speed). Skill points are poured into an array of options I didn’t even bother to count. They are very generous with these points, giving them randomly as bonuses for using a skill for the first time or slaughtering enough wildlife for instance, so you’ll be able to gain a respectable level of mastery in a number of areas. The game is laid out the way most open world games are. Objectives are plentiful, handed out by virtually anyone who will talk to you. 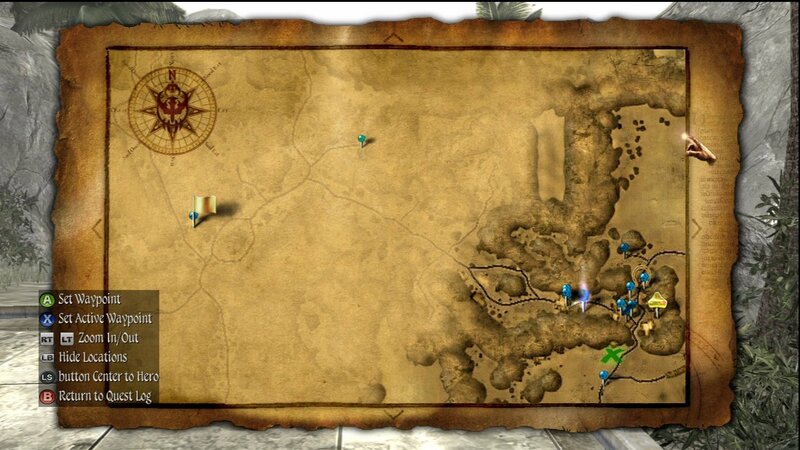 They range from the story progression objectives, such as finding a way to the next town or locating an item to activate a transport, to tiny incidental choices like giving food to a beggar. Whether your actions are big or small, they can have unexpectedly major effects. In the case of finding your way to the other side of a guarded gate, for instance, a trip through the town affords you the options of buying a forged writ of passage, getting one in exchange for helping a forger find his equipment, handing said equipment to the angry wife of said forger in exchange for showing you a secret passage, purchasing knowledge of said secret passage, being told of the passage by a grateful beggar, or just finding the passage yourself. I love a game that gives you that many options. In terms of variety, the objectives and activities make this game play more like GTA or Red Dead Redemption than Elder Scrolls. You can get a horse and do checkpoint races or moonshine running. You can act as a courier. There are dice games with a variety of rules, including ones that allow or disallow various levels of cheating. Hell, buy yourself a lute and try your hand at busking, if you want. You will not run out of things to do very quickly, that’s for sure. 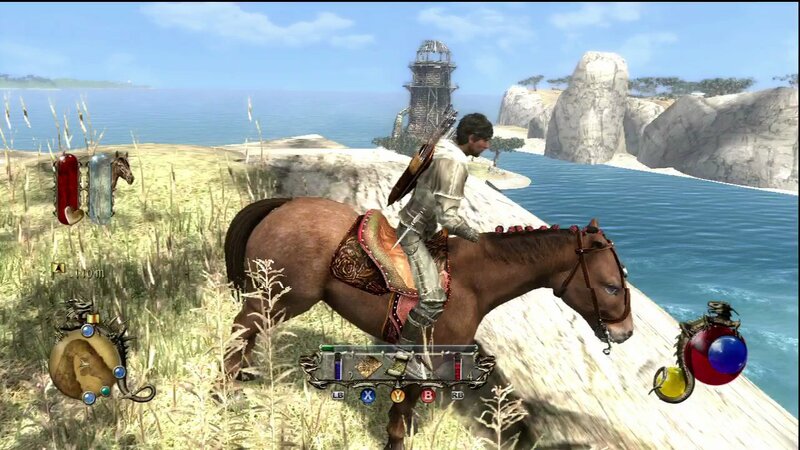 And to prevent you from having to climb on your horse or sprint everywhere, transport locations are scattered liberally around the map for quick travel. When a game leads to a gameplay section THAT long, you are more or less guaranteed to find SOMETHING you like. And I didn’t even get into how different the melee weapons can be or the entire concept of necromancy and summoning creatures. … And with only one copy of the game for review, I didn’t even get to play with multiplayer, so what you read above is effectively a review of only HALF OF THE GAME! The variety of options available to you makes this a spectacular value, if nothing else. The music for the game is orchestral and appropriate, providing you with all of the appropriate cues, both dramatically during cut scenes and gameplay-wise by bringing in battle music when you are being pursued or tossing out an incidental remark from your character. The voice acting is spotty, though. Some people are well acted and very distinctive, while others fall flat. I’m in particular not very fond of our hero. He has the generic “gruff gravelly” voice, and very little emotion makes it into his inflection. There were also normalization issues, with certain characters speaking MUCH louder than others. The script is reasonable, though. I only heard one “forsooth”, and it game from a character clearly intended to lampoon some of the unfortunate dialog choices these games have suffered from in the past. There are even a few profanities sprinkled about. And an effort is made to stir in some witty comments and humor, with mixed results. One last point, there are typos here and there in the subtitles, ranging from simple misspellings (exelent instead of excellent) to things like “likely hood” instead of “likelihood”. Tsk, tsk, tsk. The story picks up a few years after the last one left off, which is great for anyone who made it through Two Worlds I. For those who didn’t, you play as Nameless Hero, a man who’s sister is the vessel for an ancient, powerful entity. She is being used as a prison for the entity, kept alive so that our villain Gandohar can siphon power from it. You, good brother that you are, want to free her, and you get your chance when a group of Orcs (a race with precious few representatives left) springs you from the dungeon under the guidance of a prophet. You might not be blown away by the drama, but it is more than enough to serve as a suitable backdrop for the gameplay, explaining things like closed borders and hostilities, and the continuity between the games was a nice touch. There is a lot of game in TWII, and there is a lot to like. Most of my complaints are small, and mostly stem from a simple lack of polish. The issues seem more like things that were overlooked than things that were simply implemented wrong. With a bit more play testing, and a dash more care given to the details, this would have easily scored in the high nines. Even despite the numerous pet peeves, though, there was simply too much innovation and depth to score this game low. What it lacks in quality in a handful of areas, it more than makes up for in quantity. TWII isn’t perfect, but it IS excellent. 8.5 / 10: Despite some rough edges, Two Worlds II has an astounding amount to offer.